You’ve heard it — and perhaps even felt it. B2B social media isn’t always fun. B2B social should be serious and business-oriented, and therefore, completely dry. We agree to disagree. While B2B social is a tougher nut to crack in terms of straddling the line between capturing attention (and followers) and maintaining professionalism, everyone scrolling through their social feed is human. We all want that human element — human to human instead of business to business — and we’re all way more likely to notice and interact with social posts that appeal to empathy. B2B audiences are more professional than B2C, so a lighter touch goes a long way. We’re highlighting some B2B companies that are bridging the gap and posting content that resonates with their audience on social. Let’s go to Twitter, shall we? 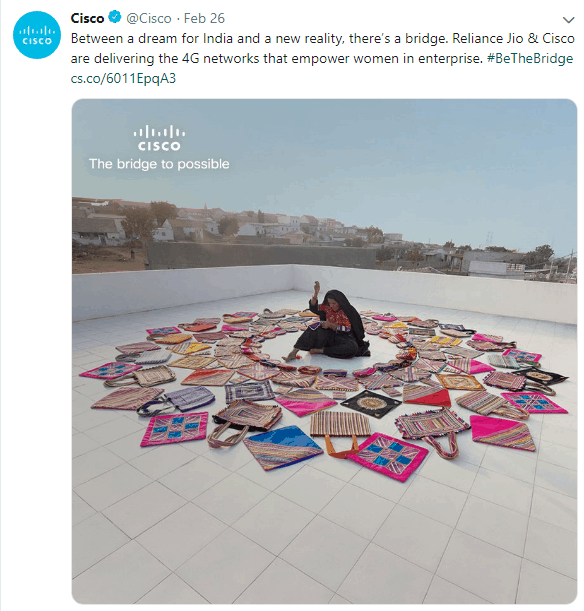 This tech giant, whose products range from Security to Cloud to Internet of Things, has a social presence as varied as their product line. From making use of video to personalized GIFs that spice up announcement posts — We love their enthusiasm! Cisco’s human-centric stories capture the breadth and depth of their products while showcasing the personality of their people. 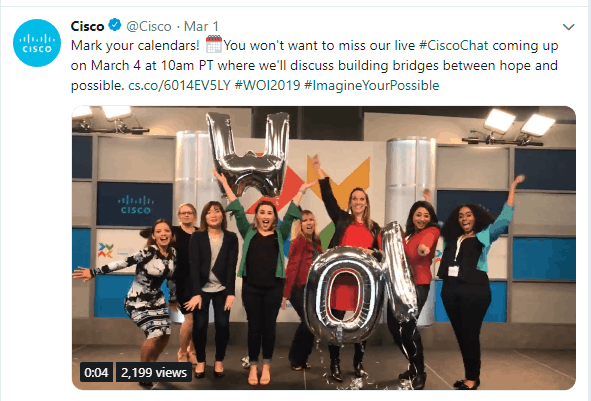 Cisco’s Twitter feed is a great example of professionalism with empathy. 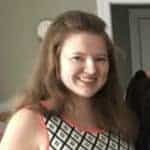 Check out their page for yourself. SiriusDecisions, a respected B2B research and advisory firm, has a Twitter feed filled with tons of resources and links to their analysts’ and business-focused content. Some research firms go fairly serious with their social media presence, which is an understandable decision. SiriusDecisions embraces humor and humanity. Take a look at this recent event promotion and you’ll see what we mean. Now that’s an event we’d like to attend. We always look forward to following their webinar live-tweets, which are informative and entertaining. Get a closer look at the flavor SiriusDecisions adds to posts on their Twitter feed. Star2Star Communications, a UCaaS and VoIP leader, has a social feed that caters to their position and history in Telecom. 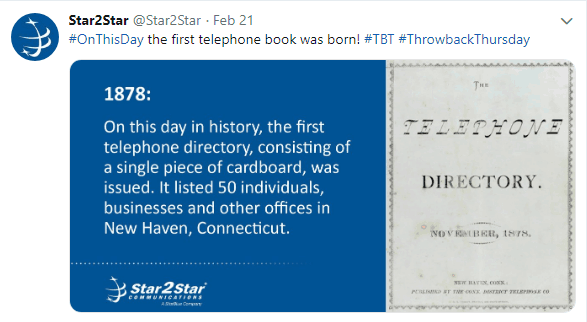 Specifically, we love their #ThrowbackThursday posts, which often call back to important moments in Telecom history. Star2Star knows their angle and they’re owning it. It’s fresh and informative. Take a closer look and learn a little about the past. 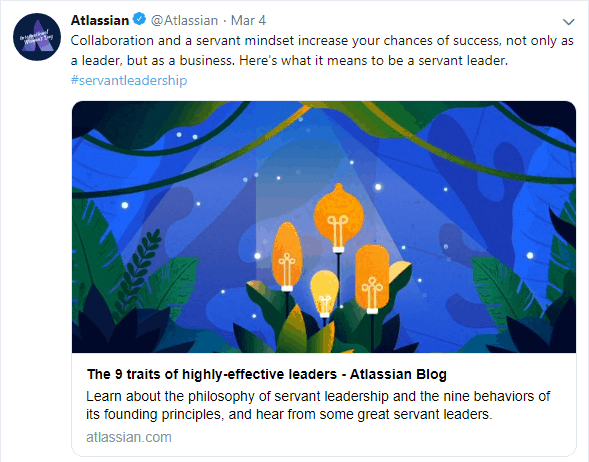 Atlassian’s social media presence is, well, fun. The company provides software development and collaborative tools to improve performance and cohesion among teams. Their social feed reflects those values. Between links to blog posts about work-life balance and think-pieces on professional self-improvement, they have a distinctly eye-catching art style that makes us stop scrolling and click to learn more. Take a look and learn a little about leadership while you’re at it! If you’re a marketer, you’re likely already aware of Marketo. And their social feed reflects this. They push thought leadership that their followers, likely well-versed in marketing themselves, will want to read. We had to recognize them because they target what their audience wants to see so well. Whether it’s their #StatoftheWeek, a marketing best practice or blog post recommendation, we love seeing them on our feed because their posts always deliver something we can actually use. Bet you want to read it, right? 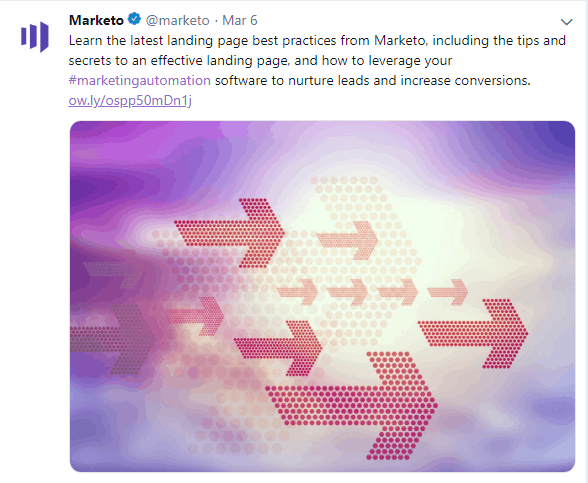 Find more clickable content on Marketo’s Twitter. Have you come across any B2B companies that are knocking it out of the park on social? We’d love to hear about them! Leave us a comment and share who you’re excited to see on your feed.